The above is a classic example of industry consolidation where the strong get stronger and the weak get weaker. Apple is one of the strong, but so is ASUS, Lenovo, Dell, Acer and even stodgy HP. In fact, among the top five/six manufacturers shown above, Apple’s growth looks pedestrian. 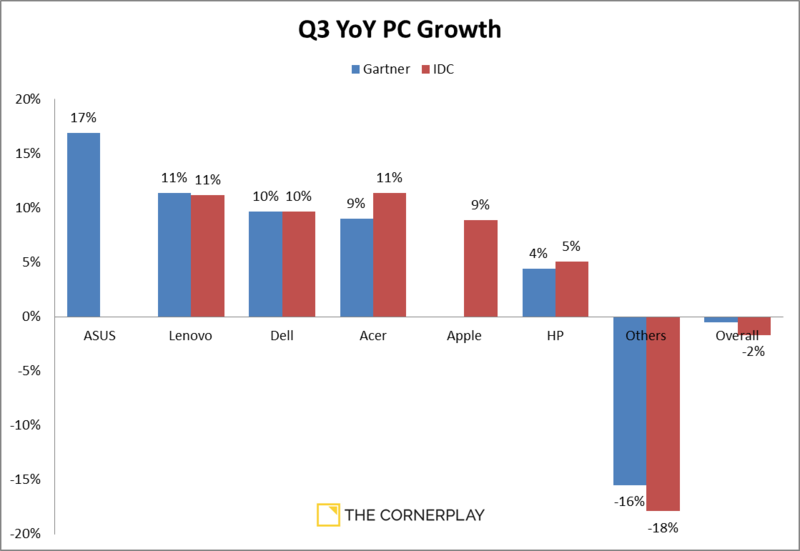 IDC and Gartner publish data (free) about only the top five largest PC makers — so numbers shown here aren’t from small PC makers; these are manufacturers with the highest volumes and thus also the most difficult to grow on a percentage basis. If you look at the PC market by only these five or six companies, it looks healthy indeed. It’s “other” manufacturers who are suffering. They are the ones getting clobbered by the big boys so it’s no wonder they are withdrawing from the market. This is also strong evidence that Windows 8 isn’t driving PC growth, or lack thereof. If it was, you’d expect market share to stay about the same among all players (Apple excepting) because everyone sells the same software, right? But no, what you see are bigger companies beating smaller ones. Apple is merely one of at least six computer makers benefiting from this trend. Mac computers are special, but not that special. Apple computers are growing quickly, but so are those from Dell, Lenovo and Acer. Postscript: I may have angered the Apple gods with this post. Another MacBook Pro just died in our office, which now makes it 4 out of 6 Apple computers. Sigh.